Heat the oil in a frying pan. Brown the meat for approx. 1 min. on each side, remove and season. Reduce the heat and wipe the cooking fat from the pan. Heat the oil in the same pan. Sauté the shallot, add the cabbage, sultanas and water, cook for a further 5 mins., season. Place the sheets of strudel pastry next to each other, brush with oil. 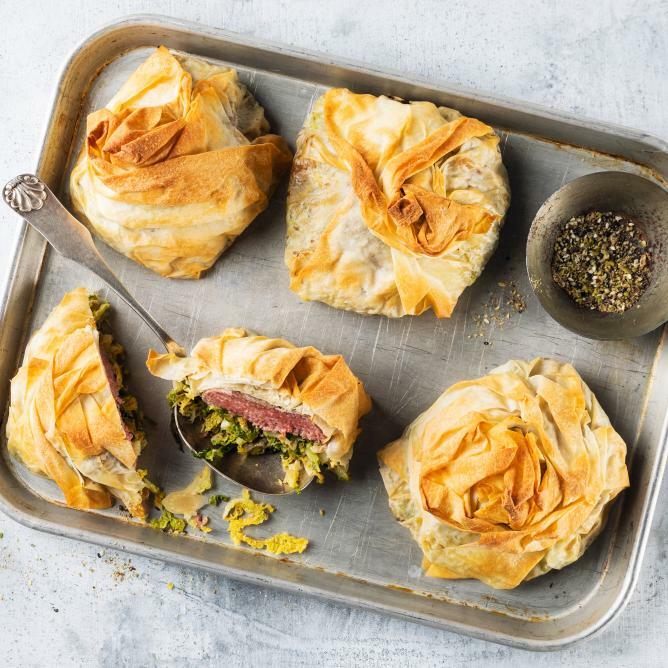 Spread 1/4 of the vegetables in the centre of each sheet, place the meat on top, fold the pastry to form a parcel. Place the parcels on a baking tray lined with baking paper. Approx. 10 mins. in the centre of an oven preheated to 200°C.